The ad has its share of critics, but the truth of the matter is that the computer, as us Gen Xers knew it, is quickly becoming, well, something else. So while some people may be upset at the ad, the truth is kids growing up these days are less likely to use one, and my daughter, who is turning four this year, will probably rarely if ever use “a computer”. Intel recognized that after upstarts like Nvidia (NVDA) and Micron Technology (MU) focused on other markets. But Intel, being a pioneer of sorts, and with plenty of capital and talent to redirect its strategy, has begun to do so. It’s not an easy task, and analogies to the steering of the Titanic are applicable here too, but this shift in strategy to data-rich segments is starting to pay dividends. The semiconductor industry is made up of companies engaged in the design, manufacturing, and marketing of a range of products that include: discrete semiconductors, optoelectronics, sensors, and integrated circuits (also called: “semiconductors,” “chips”). Some companies within the industry engage in full product development cycle, while some focus only on manufacturing (i.e. foundry companies or foundries) or design and marketing (i.e. fabless companies). Commodity Integrated Circuits serve as processors for routine tasks required of relatively simple electronic devices, such as small, single-purpose appliances. Memory products function as temporary repositories and conveyors of information to and from the Central Processing Unit (CPU) of a device. Microprocessors are the CPUs or “brain” of a computer. They contain the logic to carry out the myriad tasks expected of multifunctional and relatively complex devices (like mobile phones, laptops, and digital cameras), and are assembled with other chips (e.g. Memory) or components (e.g. sound and graphics cards) in order to perform. Finally, Complex SoCs do the same work as CPUs, but without the need to be connected to chips or components external to themselves. This is because SoCs contain a CPU together with other components like: a Graphics Processing Unity (GPU), a memory chip, power management circuits, and network connectivity provisions (i.e. 3G, 4G/LTE, and WiFi). The total chip industry is reported to have generated $419 billion in revenue globally in 2017, and is anticipated to reach $451 billion in 2018. In Data Processing, chips are used in personal computers (e.g. desktops, notebooks), servers, and related hardware (e.g. printers). In Communications, chips are utilized for wireless and wired communications infrastructure and equipment (e.g. smartphones, tablets, and broadband devices). In the Consumer market, chips are built into household appliances and home entertainment equipment (e.g. TVs and gaming consoles). In the Industrial market, chips form part of power supply equipment, as well as specific-use devices relevant to particular business settings. For instance, in the logistics and retail contexts, chips are used in barcode scanners and point-of-sale terminals. In the medical context, chips are used in ultrasound imaging machines and patient monitors. The Automotive market uses chips in electronic components like lighting and power-steering. In the Military & Aerospace market, chips are used for bespoke applications. The Communications and Data Processing markets accounted for the majority of semiconductor sales and revenue in 2017. 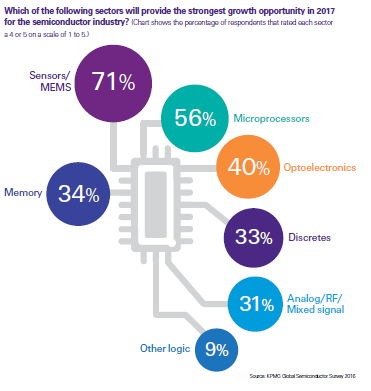 While the Communications and Computing segments have traditionally been the reliably lucrative end markets, the 2017 KPMG Global Semiconductor Outlook reveals emerging opportunities yet to be fully exploited. 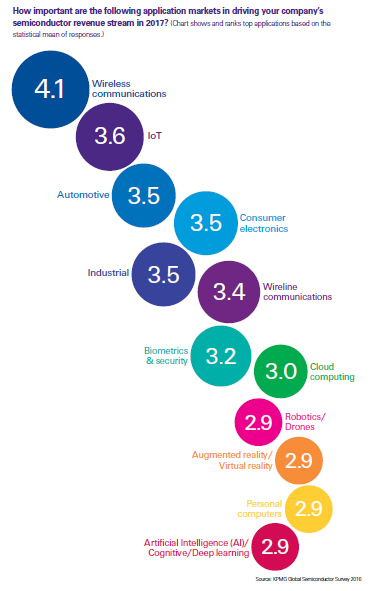 Internet of Things, Automotive, Consumer Electronics and Industrial follow Wireless Communications as top revenue drivers. In regards to product types, Sensors/Micro-Electronic-Mechanical Sensors (MEMS) have the strongest growth potential, followed by Microprocessors, and Optoelectronics. Semiconductor companies compete on the basis of a product’s innate qualities (e.g. performance, reliability, energy efficiency, integration, innovative design, and features) as well as external factors like price, brand renown, technical support, and availability. Intel is engaged in the design, manufacturing, and marketing of semiconductor products. From its establishment in 1968 until 2015, its focus was on developing and providing components and platforms for designers, manufacturers, and users of servers and personal computers (PCs). For many years, the business was considered PC-centric. Intel led in the industry terms of manufacturing technology, volume sales, and revenue in so far as the PC was the predominant personal computing device. Demand for Intel products declined, however, as mobile device sales overtook PCs in 2011, since these devices required powerful processors that were also very energy- and cost-efficient – something Intel did not offer then, and which caused the company to miss out on what would have been a growth boost from the mobile device era. In 2016, amidst the continued decline of PC sales and a persistent handicap in mobile, the company changed tack and announced the start of its transformation from being PC-centric to data-centric – in a bid to position the company at the forefront of the next frontier of computing. Essentially, this shift meant expansion of the company’s Target Available Market (TAM) and the reach of its core product portfolio, as well as diversification of its portfolio – beyond PC and server CPUs. The ultimate aim is to compete in increasingly more relevant and rewarding end markets, such as in cloud computing and the Internet of Things (IOT), which may not necessarily compensate for slumping PC-related volumes but provide the opportunity to command higher Average Selling Prices (ASPs). Intel also reconfigured its organization. Currently, its operating units are: Client Computing Group (CCG), Data Center Group (DCG), Internet of Things Group (IOTG), Non-Volatile Memory Solutions Group (NSG) and Programmable Solutions Group (PSG). CCG is concerned with platforms for PCs (notebooks and desktops), as well as wired and wireless connectivity products. DCG covers servers, storage, and workstation platforms for small, medium, and large enterprises. IOTG includes high-performance platforms that have applications in retail, automotive, industrial, and other areas. NSG includes memory products (i.e. Intel® Optane™ and 3D NAND technology) used in solid-state drives (SSDs). PSG includes field-programmable gate arrays (FPGAs) and other programmable semiconductors, which have applications in communications, data center, military, industrial, and automotive. CCG equates to the PC-centric side of the business and primarily markets “Platform Products” for consumer end-use: microprocessors (processor or central processing unit/CPU) combined with chipsets, stand-alone System on Chip (SoC), or multichip packages, alongside Adjacent Products (e.g. modem, Ethernet, and silicon photonic). Meanwhile, DCG, IOTG, NSG and PSG roll up to the data-centric side, where Platform Products are promoted alongside relevant Adjacent Products, Mobileye for IOTG, FPGA for PSG, and high-performance memory solutions for NSG. Platform Products and Adjacent Products can be integrated to create comprehensive technological systems addressing the respective users’ needs. 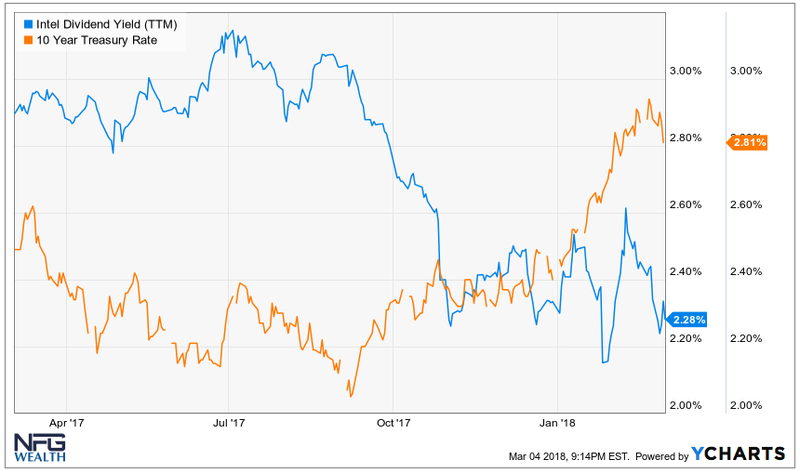 Intel’s revenues, which are sensitive to seasonality, are driven by sales volumes as well as ASPs, and may be substantially offset by research and development (R&D) and other operational costs. As of the end of 2017, as reported in Form 10-K, Platform Products delivered 82% of revenue vs. Adjacent Products, which delivered 17%. The PC-Centric side of the business contributed 53% of revenue vis-à-vis data-Centric’s 47%. Its three largest customers, Dell (16%), Lenovo (OTCPK:LNVGY) (13%), and HP (NYSE:HPQ) (11%), which belong to the top ten semiconductor buyers in 2017 according to a Gartner report, accounted for 40% of total revenue (per Form 10-K, December 30, 2017). A supplier of silicon components and platforms, Intel faces competition from other designers, makers, and sellers of similar products with comparable performance, better energy efficiency, and lower cost. Its Platform Products compete with the Advanced Micro Devices’ (AMD) portfolio, which are positioned as comparably powerful yet less costly. Additional competitors are ARM Holdings (NASDAQ:ARMH) – which designs various foundry-produced components and platforms, which have applications in servers, as well as mobile devices. 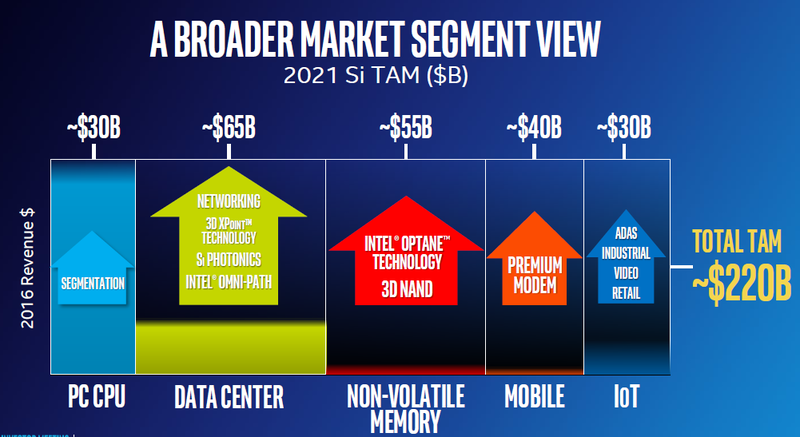 Within the Adjacent Products, Intel comes up against Qualcomm (QCOM) for 5G modems, Xilinx (XLNX) in the programmable chips market, and against Micron Technology in the non-volatile memory space. Intel closed 2017 on a celebratory note, having exceeded its financial targets and placing it a full year early in its three-year plan. Total revenue increased by $17.1 billion (+8% year-on-year) and operating income was up by $5.9 billion (+21% year-on-year), in spite of dips in revenue (-3%) and operating income (7%) in the PC-centric side of the business. Earnings per share (EPS) increased 37% to $1.08 and the quarterly dividend was raised by 10%. Overall performance was buoyed by the individual operating segments’ performance within the data-centric side. DCG revenue increased by 20% vs. the fourth quarter in the past year, owing to customer uptake of high performance products (like Xeon Scalable) that allowed for higher ASPs, in addition to substantial volume in the cloud segment. PSG, IOTG, and NSG’s collective revenue increased by 21% year-on-year. 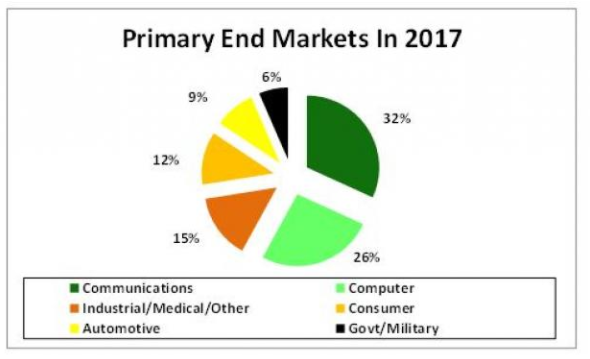 PSG outcome was driven by growth in industrial, military, and automotive market segments, advanced products, and final purchases of legacy products. IOTG’s contribution resulted from sales of platform and adjacent products across retail, industrial, and smart video segments, while NSG benefited from high demand in data center. DCG, PSG, and IOTG reported significant increases in operating income of 59%, 95%, and 43%, respectively, while NSG recorded a positive operating margin vs. the past year. 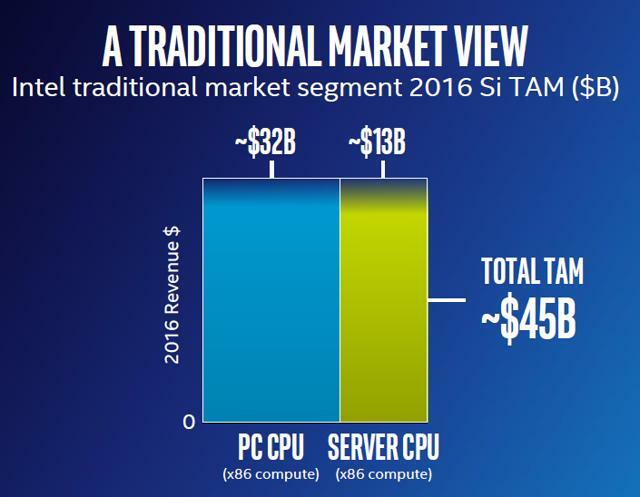 Intel’s strategy execution to tap into data-rich segments was successful. It made inroads towards establishing its position as a contender in emerging end-markets. In Autonomous Driving – Per the annual report, the acquisition of Mobileye grants Intel the capacity to “create automated driving solutions from car to cloud” as it combines Mobileye’s competency in “the development of computer vision and machine learning, data analysis, localization, and mapping for advanced driver assistance systems and autonomous driving” with its own “high-performance computing and connectivity expertise”, and ultimately position itself “as a leading technology provider in the fast-growing market for highly and fully autonomous vehicles.” Case in point, “Mobileye had a strong finish to 2017 with a total of 30 Advanced Driver-Assistance Systems (ADAS) customer designs wins as well as design wins for advanced L2+ and L3 autonomous systems with 11 automakers” (Per the 4th Quarter Earnings Release). In Artificial Intelligence – Apart from the Mobileye transaction, Intel’s Movidius vision processing unit was included in Google’s (NASDAQ:GOOG) (NASDAQ:GOOGL) AIY vision kit; its Intel Atom® Processor and Intel Gen9 Graphics Engine were used in Amazon’s (NASDAQ:AMZN) DeepLens, “the world’s first deep learning enabled video camera for developers” (from the Seeking Alpha 4Q 2017 Earnings Call Transcript). In Memory – Manufacturing capacity was upgraded from “2D NAND to 3D NAND, reaching 100% 3D NAND production at the end of 2017” (per the 2017 Annual Report). In 5G and connectivity – The “first family of 5G NR multi-mode commercial modems, the Intel XMM 8000 series modems” was launched and “the 5th generation LTE modem, the Intel® XMM™ 7560 modem” was introduced. Despite the celebratory mood, the disconcerting topic seemed to be the information security risks posed by Meltdown and Spectre. Preempting questions on the matter at the last earnings call, Intel CEO sought to reassure concerned parties by saying that the company is focused on urgently “delivering high-focus mitigations to protect its customers’ infrastructure from these exploits” and that work is underway for protective silicon-based changes to be part and parcel of its future products, and that these will begin to be available in 2018. He also emphasized that “Security is a top priority for Intel,” a cornerstone of its products, and crucial for the success of its data-centric strategy. 2018 will be the third year of Intel’s announcement of its transformation of growing beyond its traditional data processing end-markets into data-rich segments. It will be critical to take note of how the company delivers on its promise to address the incumbent information security threats, and to ensure the integrity of its forthcoming products within hardware, to make it resistant to Spectre, Meltdown, and similar exploits. 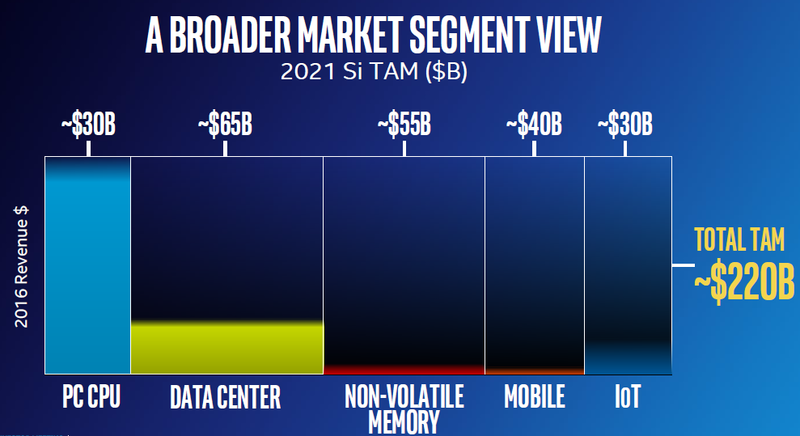 The other crucial areas to watch are the revenue split between the PC-centric and data-centric sides of the business, and what additional investments and decisions the company will make to further decrease reliance on PC-centric sales and increase penetration of the redefined TAM of $260 billion. Intel currently pays a decent dividend yield of 2.3%, which until recently, was favorable compared to the 10YR Treasury rate. But as of early this year, the 10 yr has spiked to 2.81%. Analysts currently estimate an average price target of $51.72, which is a modest 5.6% increase from current levels. At a current PE of 24x, the stock looks fully priced. But an often-overlooked metric, the forward PE multiple is at 13x, which looks more reasonable even if it too looks high compared to its recent historical average. The driver is a considerable increase in EPS estimates for next year from $3.40 to $3.80 per share, partly due to the impact of recent tax reform and partly due to improved prospects. The company’s non-GAAP EPS guidance is a more modest $3.55 per share. Applying a PE multiple of 24 to $3.55 per share and $3.80 per share results in a much more optimistic price target of $85 to $92, more than 73% return from current levels. The high analyst price target is $60, which I think is a more reasonable expectation to have, which results from an EPS estimate of $3.55 and a multiple of 17. There is a lot of competition within the automobile, robotics, cloud, and data segments and in some of those markets, Intel’s competitors have a head start. Furthermore, the semiconductor industry is highly complex and evolves quickly based on the dynamics of its end user markets. The stock hit a multi-year high recently and I am wary of a pullback. For income investors, we suggest writing a covered call with a January 18, 2019, call with a strike price of $60 for $1.43, according to prices as of March 2nd, 2018. That’s an additional 3% on Friday’s closing price of $48.98, providing total income of more than 5.5% annualized and, if called, would result in another 22% upside on price appreciation. Disclosure: I/we have no positions in any stocks mentioned, but may initiate a long position in AMD, INTC over the next 72 hours.